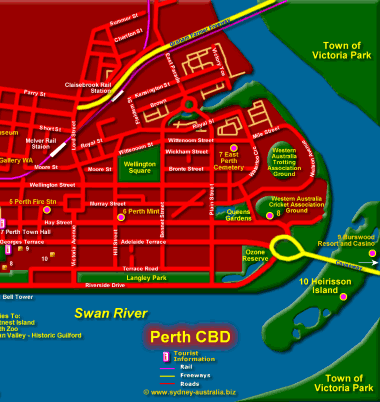 Situated on Swan River, Perth WA is regarded as the most isolated city in the world and yet one of, if not the most, beautiful of Australia’s cities. See more on Perth Western Australia. Information about working in Australia - jobs, employment Work in Australia - Jobs. To the east of WA, there are the states of South Australia SA and the Northern Territory NT. Western Australia accommodation includes hotels, motels, luxury resorts, serviced apartments, studios, caravan parks, bed and breakfasts and farm stays. For Hotels in Australia and other accommodation, see Hotels in Australia. 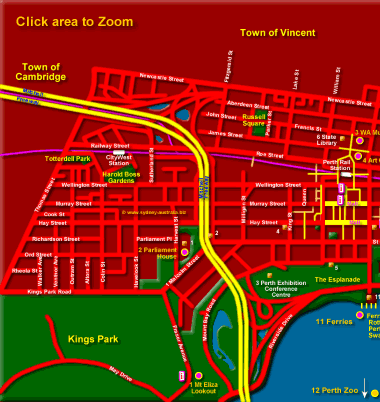 Main Photo: Attractions Map of Perth - Click to Zoom Area or see the Western Australia Maps.